The B&B is for sale & will be closed until new owners are found. Prices are per Room per night and include a continental breakfast and taxes. The maximum occupancy per room is two people: cots or extra beds in the room are not permitted. There is a bar in the village (about 1 kilometre) that can provide food. 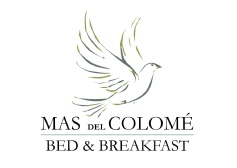 We regret that we do not have a restaurant at Mas del Colomé but an evening meal can be provided by prior arrangement. We require two days notice for evening meals requested on the first night’s stay and during the breakfast service on subsequent days. Please advise us of any food allergies or dislikes as there is no choice of menu and we wouldn’t wish to prepare something that our guests would not wish to eat. The cost of a three course evening meal (wine not included) is € 17.50 per person.